How does ECM ensure that your information is secure? ecmservice.com and ecmhomewarranty.com will maintain practices and procedures designed to ensure the security, integrity and confidentiality of customer information. We restrict and limit access to customer information only to those employees who need it to carry out their business functions, and educate our employees about safeguarding customer information and preventing its unauthorized access, disclosure or use. When credit card information is transmitted online, ecmservice.com and ecmhomewarranty.com uses industry standard security measures called SSL (secure socket layer encryption). ecmservice.com and ecmhomewarranty.com will monitor and continually adopt, as appropriate, new technological improvements that are designed to aid in ensuring the accuracy and security of customer information. By using our web site, you consent to the collection and use of this information by ECM, in the manner expressed herein. What type of information does ecmservice.com and ecmhomewarranty.com collect? ecmservice.com and ecmhomewarranty.com gathers customer information needed to provide superior service, communicate offers on services and products which we believe will be of interest to you and to administer our business. In order to best serve you, we may gather information from you in a few instances. First, when you visit our site, we may collect non-personally identifiable information from you. Through the use of computer “cookies”, we collect data, such as your IP address, browser type, domain name, and specific ECM web pages through which you click. This data is collected automatically and utilized in aggregate to help us look for trends so that we can improve our website and your ecmservice.com and ecmhomewarranty.com experience. Additional information regarding computer cookies and how to disable them is described below. Second, we may ask you to voluntarily provide information in a few circumstances. When you request a quote or purchase items from ecmservice.com and ecmhomewarranty.com, we will ask you to voluntarily provide certain personally identifiable information, such as your name, address, telephone number, e-mail address, and credit card number. We need this information to process and fulfill your quote request or order and to notify you of order status. ECM does not, and will never, rent or sell customer information to outside marketers or any other company. “Cookies” are small pieces of information that are stored by the browser on your hard drive. ecmhomewarranty.com and ecmhomewarranty.com may store some information on the visitor’s computer in the form of a cookie or similar file. The cookies that are configured by us do not contain any personally identifying information, such as your name, or sensitive information, such as your credit card number. The cookies allow us to recognize you when you return to our site so that we may provide you with a customized experience that we feel will be of value to you. Most web browsers allow you to exercise control over cookie files on your computer by erasing them, blocking them, or notifying you when such a file is stored. Please take a look at your particular browser for instructions on this function. If you do elect to disable the ecmservice.com and ecmhomewarranty.com cookie, please note that you may not be able to take full advantage of a personalized experience at ecmservice.com and ecmhomewarranty.com. 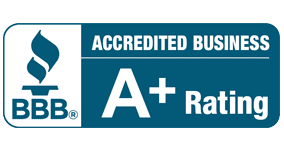 We have used East Coast Mechanical for over 8 years, and they have preformed with the utmost professionalism and integrity. Just recently they changed our old Air conditioner to a new model and the installation was great! 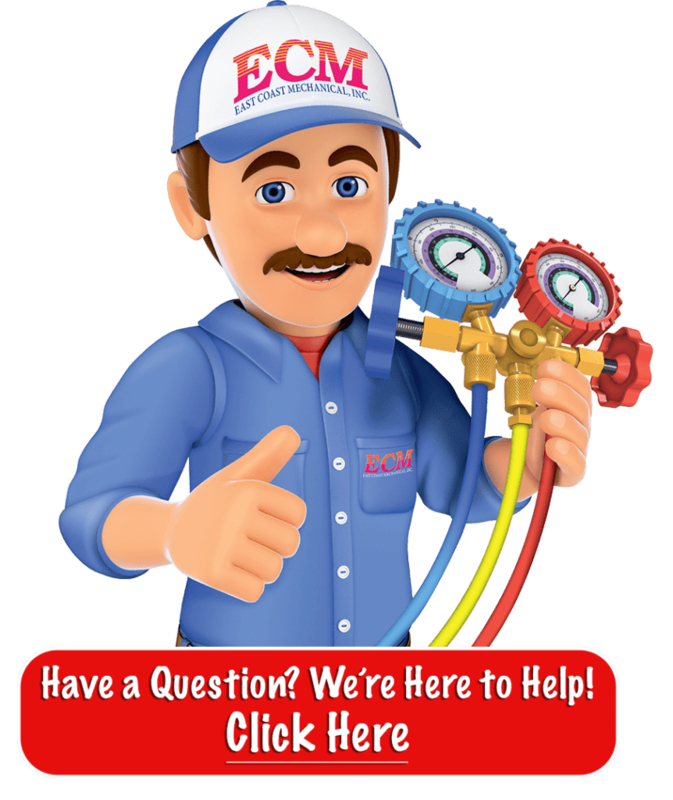 ECM replaced our A/C within one day of the initial service call. The tech and install crew were very professional, knowledgeable and personable. They all knew their respective jobs and performed them very well. They also cleaned up after themselves. We have a household service contract with ECM for over 9 years and will continue to renew. Their service is outstanding. ECM installed a new air conditioning system in my home about one month ago. The installers were on time, courteous and knowledgeable. System works great and the price was right. Would recommend them to my neighbors and friends. Our second AC from ECM. They did an awesome job with the installation. Left my garage spotless, vacuum my entire garage, replaced all areas with new material for my new ac…replaced my platform and painted it white. Juan, my tech explained my new thermostat to me with ease. 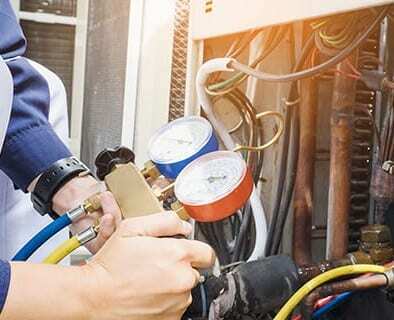 You couldn’t ask for a better company to install and service your unit. Been using ECM for years, never have an issue. Just about always in the time window for arrival (if not they call6, fix problem efficiently and effectively, if a part is needed they order it immediately and try to get you the next available appointment right when the part is ready. The technicians are great, never rude or disrespectful… really a great company! And they cover SO much!! Would highly recommend! A technician responded within an hour of our breakdown and did a thorough job in defining the problem. A new AC unit was required (old one was 10+ years) but there was no sales pressure involved. The next morning the installation crew arrived (on time) and worked through lunch to finish quickly. They used protective blankets on the floor and swept the area upon completion. A very courteous and professional job!